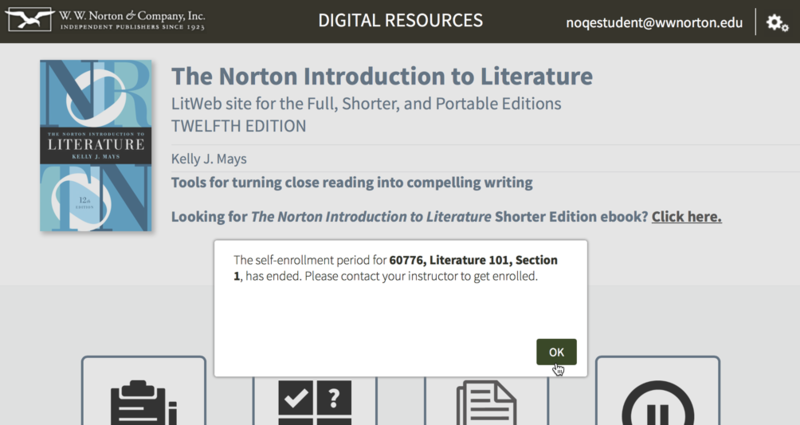 Online Quizzes provide instructors with the ability to assign due dates for the quizzes associated with their Norton textbook. How do I set due dates? You can set Grades Accepted Until dates for Online Quiz assignments. After a Grades Accepted Until date for an assignment passes, students can continue to complete the Online Quiz assignments but they can no longer improve their final grades for that assignment. Click [set] across from the assignment. Select a Grades Accepted Until date and click the Set Grades Accepted Until button. The first time you set a GAU, you'll be asked to choose your time zone. The next time you create a GAU, your time zone will be automatically selected. 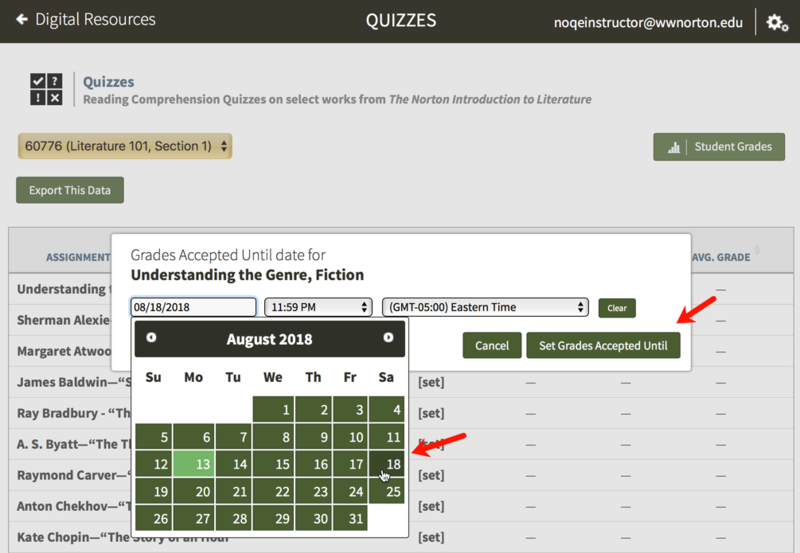 Note: If you’re using the Student Grades grid to track average NOQE grades, only assignments with Grades Accepted Until dates will count toward NOQE averages. In other words, if you're using NOQE for a grade, set Grades Accepted Until dates for all assignments you're asking students to complete! How do I modify questions in an Online Quiz assignment? Questions cannot be modified in Online Quiz assignments. How do I copy assignments and settings from one Student Set to another? Begin by opening the Manage Student Sets window within Quizzes. 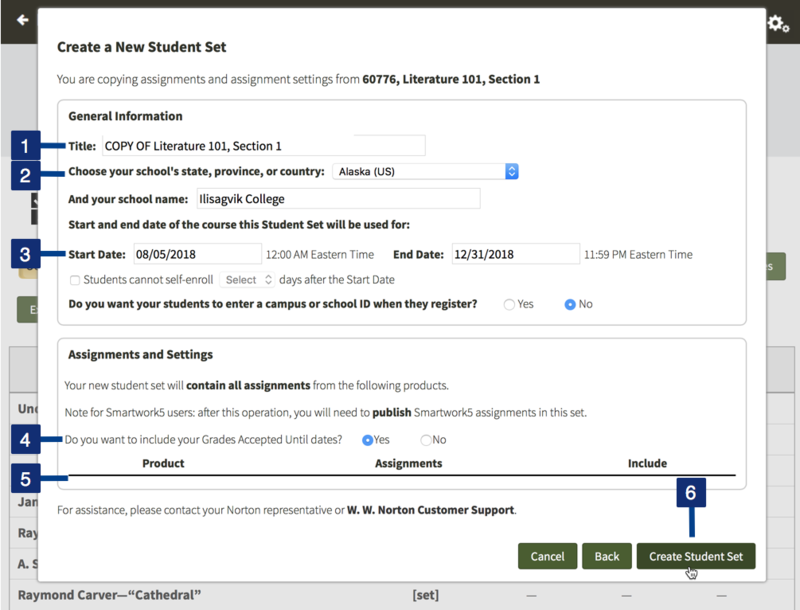 Click on the gear icon in the upper-right corner and select Manage Student Sets from the menu. Click on the Create New Student Set button in the upper-right corner. Select option 2, choose a Student Set from the drop-down menu, and click the Next button. 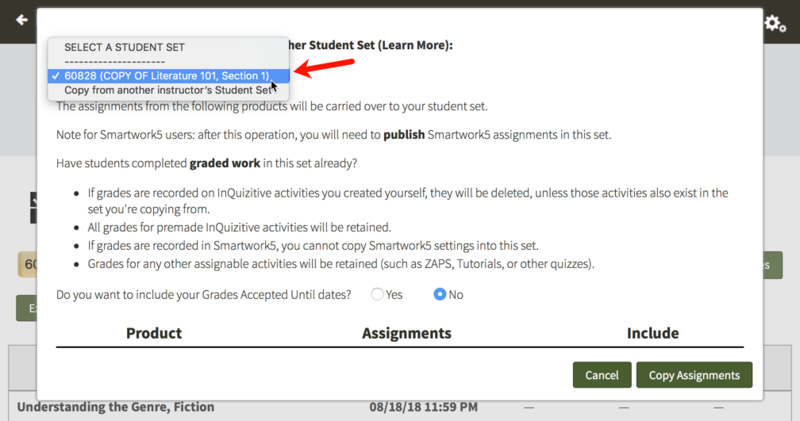 If you would like to copy the assignments and settings from another instructor's Student Set, select option 2, choose Copy from another instructor's Student Set from the drop-down menu, enter the Student Set ID number, and click the Next button. COPY OF will be added to the beginning of the original Student Set's title. Please feel free to modify the title to fit your needs for this new Student Set. Select your state, province, or country from the drop-down menu and begin typing your school's name into the text field that appears. A list of schools will appear as you type. Select your school from the list or continue typing. Select a Start and End date for this Student Set. If you would like the Grades Accepted Until dates to be copied from the original Student Set, select Yes. All GAUs set in the original Student Set will be copied to this Student Set. You'll be given a brief summary of how many Online Quiz assignments will be copied from the original Student Set. 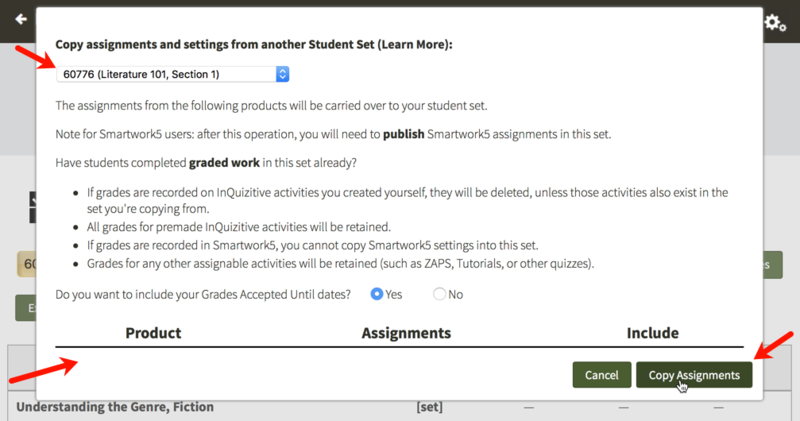 The settings that will be copied include: minimum number of questions to complete each activity, selected learning objectives, and any custom assignments that you created; previous student results will NOT be copied to the new Student Set. Finally, click the Create Student Set button. You will then receive a confirmation message. 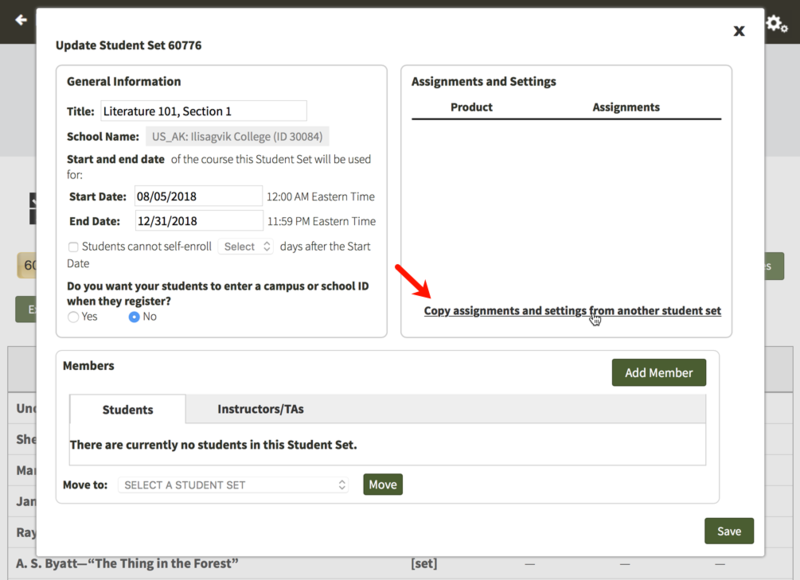 Please review the information and if everything is correct, click the Confirm button to create the new Student Set with the copied assignments and settings. If you need to make any adjustments, click the Back button to return to the previous screen. 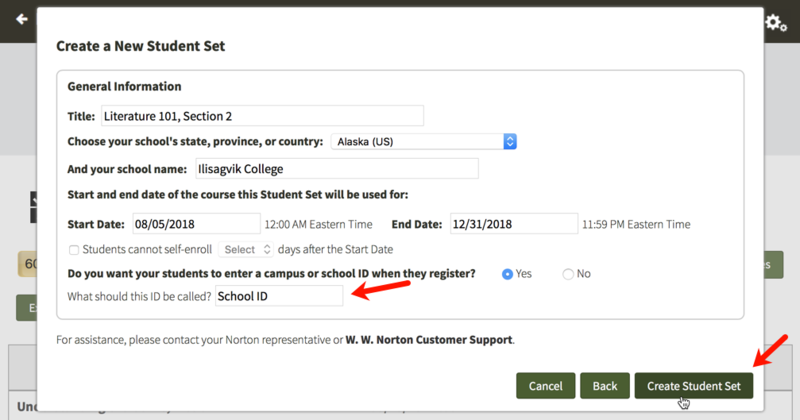 Even though the assignments and settings were copied from another Student Set, your new Student Set will be assigned a new, unique Student Set ID number. Be sure to give your students the new Student Set ID number so that they can join this specific Student Set. 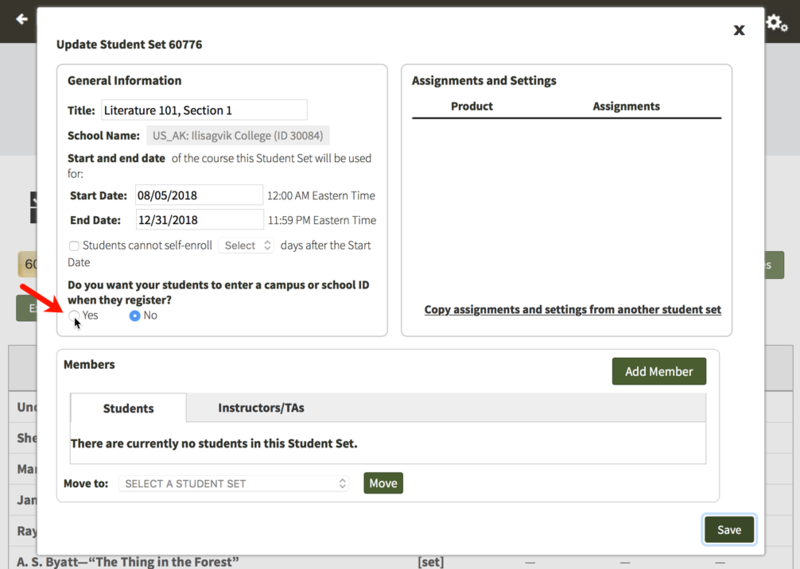 On the Manage Student Sets window, click on the Update button to the right of the Student Set to which you would like to copy the assignments and settings. In the Assignments and Settings section, click on the Copy assignments and settings from another student set link. Select the Student Set from which you would like to copy the assignments and settings from the drop-down menu. 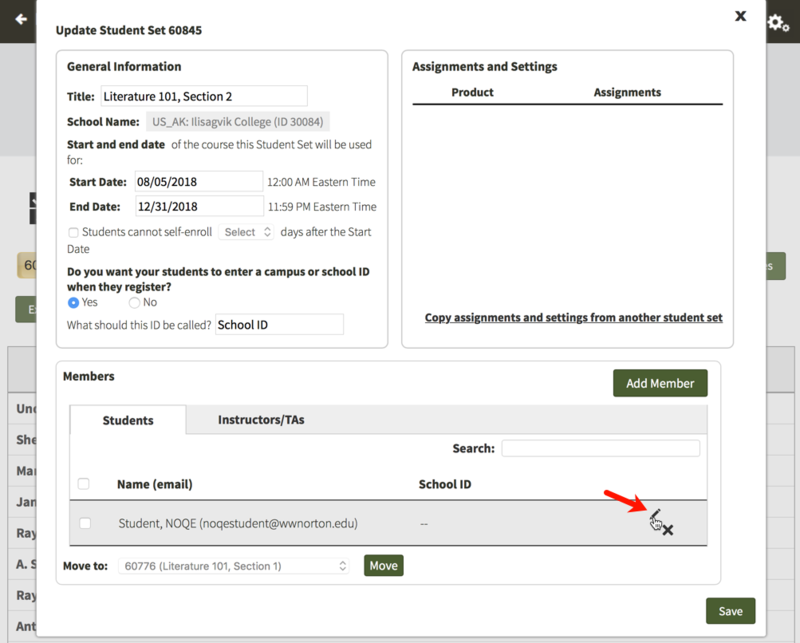 If you would like to copy the assignments and settings from another instructor's Student Set, select Copy from another instructor's Student Set from the drop-down menu, enter the Student Set ID number, and click the Apply button. 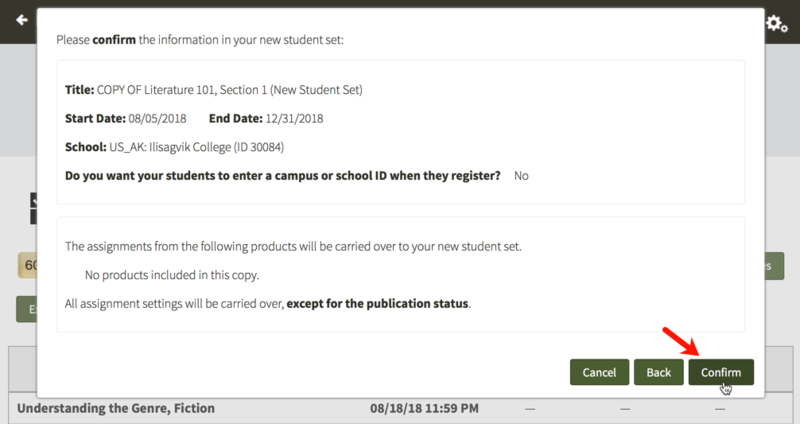 If you would like to copy the Grades Accepted Until dates from the original Student Set, click Yes to the right of Do you want to include your Grades Accepted Until dates? Finally, click the Copy Assignments button. You will then be asked if you're sure you want to copy the assignments and settings into this Student Set. To proceed, click on the Copy Assignments button. 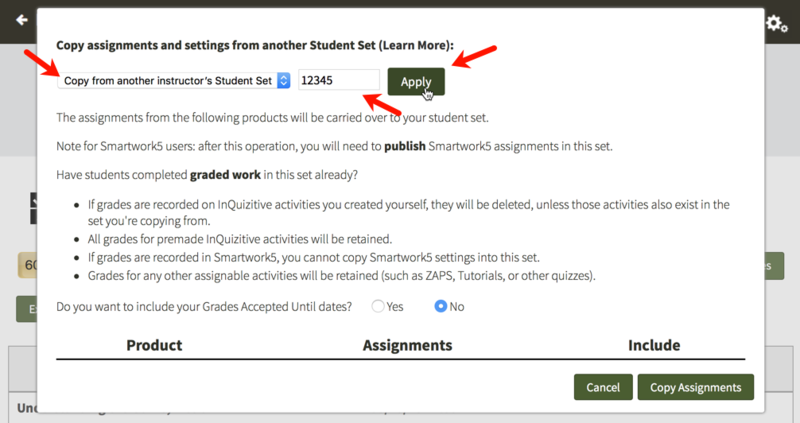 Note: All assignments and settings in the new Student Set will be overwritten by the assignments and settings from the original Student Set. Previous student results will NOT be copied to the new Student Set. Can I require students to enter a school ID? Click on the gear icon in the upper-right corner and select Manage Student Sets from the menu. Click on the Create New Student Set button. Option 1. Create a new Student Set from scratch will be selected by default. Click on the Next button. 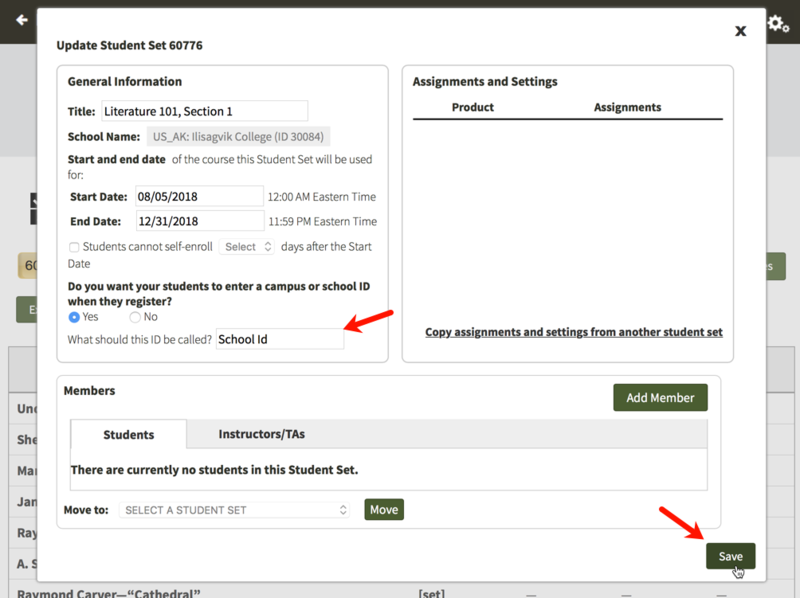 Enter a title for your new Student Set, choose your school's state from the drop-down menu, begin typing your school's name into the text box that appears and select the proper school from the list, and select start and end dates for your Student Set. Select Yes to the right of Do you want your students to enter a campus or school ID when they register? You will then be given the opportunity to change the label of the ID for your Student Set. The default School ID will be automatically populated into the text field but please feel free to change this to anything you'd like. This label will be displayed when your students are asked to enter their ID and when you review student results. IDs can contain letters and numbers and they do not have a minimum or maximum length. Finally, click the Create Student Set button and you will be given your new Student Set ID. Make a note of the Student Set ID and distribute it to your students so that they can join this Student Set. When your students initially attempt to join this Student Set, they will be asked to enter their ID. 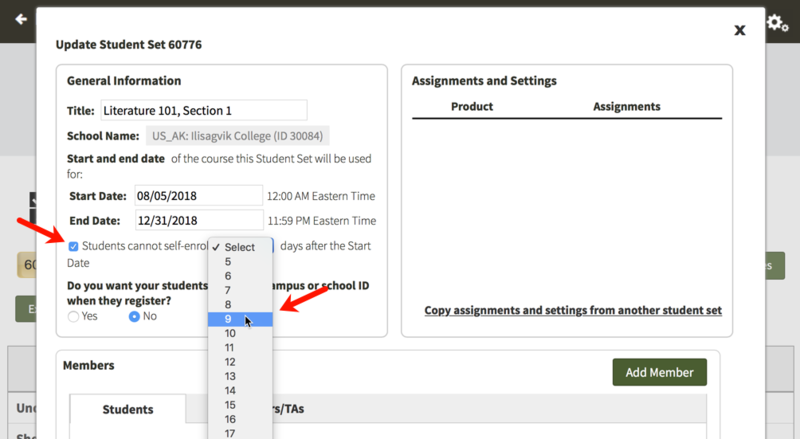 If students are unsure of their ID or do not yet have one, they can simply click the Next button to add themselves to the Student Set and continue on to the digital resources. The next time they login to access the digital resources, they will be asked to enter their ID again. Students will be asked to enter their ID each time they access the digital resources until they finally enter one. Click on the Update button to the right of the Student Set for which you would like to require an ID. Select Yes under Do you want your students to enter a campus or school ID when they register? You will then be given the opportunity to change the label of the ID for your Student Set. The default School Id will be automatically populated into the text field but please feel free to change this to anything you'd like. This label will be displayed when your students are asked to enter their ID and when you review student results. IDs can contain letters and numbers and they do not have a minimum or maximum length. Click on the Save button when you are finished. 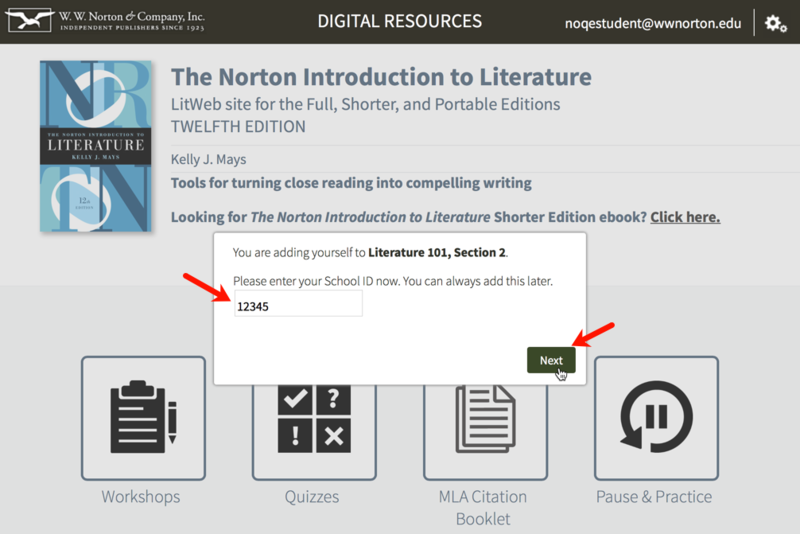 The next time your students login and access the digital resources, they will be asked to enter their ID. If students are unsure of their ID or do not yet have one, they can simply click the Next button to continue on to the digital resources. The next time they login to access the digital resources, they will be asked to enter their ID again. Students will be asked to enter their ID each time they access the digital resources until they finally enter one. Can I prevent students from enrolling in a Student Set after a specific number of days? Option 1. will be selected by default. Click on the Next button. Click the checkbox to the left of Students cannot self-enroll Select days after the Start Date and use the Select drop-down menu to choose how many days after the start date of your Student Set you would like to close the self-enrollment period. You can select any number from 5 to 100 days after the start date. Any students who try to join this Student Set after the self-enrollment period has ended will receive the message below. Since the self-enrollment period has ended, you will need to manually add students to the Student Set from that point on. Click on the Update button to the right of the Student Set for which you would like to end the self-enrollment period after a specific number of days. Click the checkbox to the left of Students cannot self-enroll Select days after the Start Date and use the Select drop-down menu to choose how many days after the start date of your Student Set you would like to close the self-enrollment period. You can select any number from 5 to 100 days after the start date. Click the Save button when you're finished. How do I move students from one Student Set to another? Click on the Update button to the right of the Student Set in which the student is currently enrolled. In the Members section, locate the student you would like to transfer to another student set and click the checkbox to the left of his or her name. 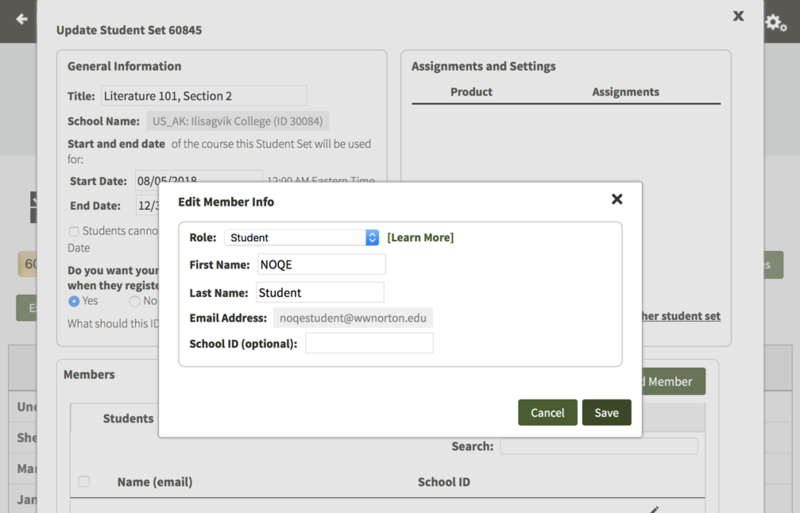 Using the drop-down menu to the right of Move to: select the new Student Set and click the Move button. 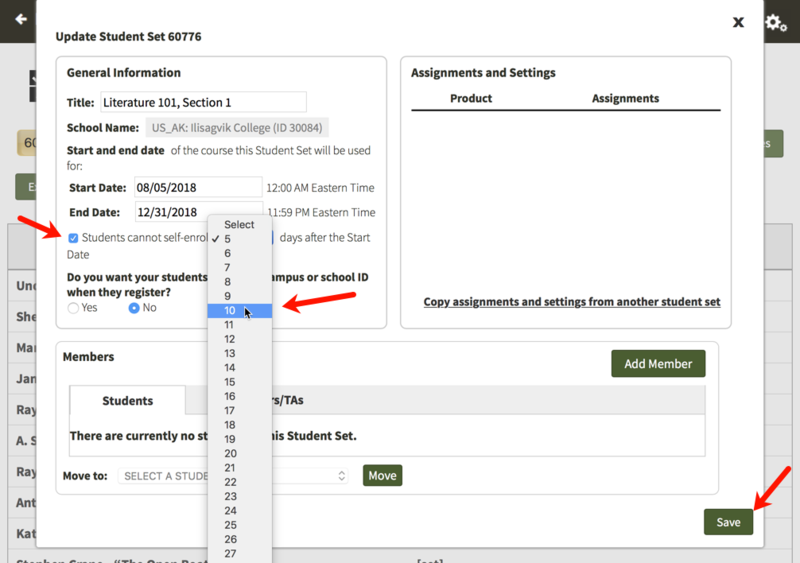 If you would like to completely remove a student from your Student Set, click on the X icon to the right of the student's name you would like to remove. How do I edit student information within a Student Set? Click on the pencil icon to the right of the student whose information you would like to modify. Using this window, you can adjust the role of the student, change the first or last name, and add or edit an ID. There is no way to change a student's email address. If you have a student who needs to make a change to their email address, please ask them to contact our help desk for assistance.